Dirt Wheels Magazine , the Worlds #1 ATV Magazine. 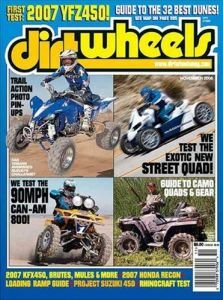 Dirt Wheels Magazine was the first magazine to focus on this fast growing sport and has been the leading publication for all terrain vehicle fun for more than 10 years. Dirt Wheels covers all aspects of ATV riding, from high-performance to family outings, and is the perfect guide to off-road adventure! Dirt Wheels Magazine is packed full of information and wisdom for ATV riders, racers, wrenches, and readers.